Citation: Mendonça, Ângelo, et al. Spanish Gigaword Third Edition LDC2011T12. Web Download. Philadelphia: Linguistic Data Consortium, 2011. Spanish Gigaword Third Edition, Linguistic Data Consortium (LDC) catalog number LDC2011T12 and ISBN 1-58563-596-0, was produced by LDC. 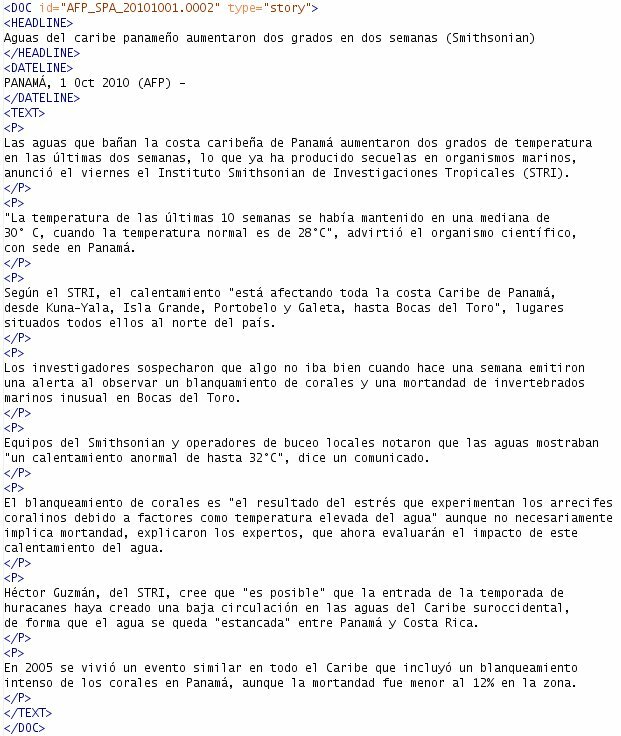 It is a comprehensive archive of Spanish newswire text data that has been acquired over several years by LDC. Spanish Gigaword Third Edition includes all of the content of the second edition (LDC2009T21) and adds data collected from January 1, 2009 through December 31, 2010. The seven-letter codes in the parentheses above include the three-character source name abbreviations and the three-character language code (spa) separated by an underscore (_) character. The three-letter language code conforms to LDCs internal convention based on the ISO 639-3 standard. All text data are presented in SGML/XML form, using a very simple, minimal markup structure all text consists of printable ASCII, whitespace, and printable code points in the Latin1 Supplement character table, as defined by both ISO-8859-1 and the Unicode Standard (ISO 10646) for the accented characters used in Spanish. The Supplement/accented characters are rendered using UTF-8 encoding. advis : (short for advisory) These are DOCs which the news service addresses to news editors -- they are not intended for publication to the end users (the populations who read the news). This type contains formulaic, repetitive content (contact phone numbers, etc). other : This represents DOCs that clearly do not fall into any of the above types -- in general, items of this type are intended for broad circulation (they are not advisories), they may be topically coherent (unlike multi type DOCS), and they typically do not contain paragraphs or sentences (they arent really stories) these are things like lists of sports scores, stock prices, temperatures around the world, and so on. An update to Spanish Gigaword Third Edition was issued to fix an issue with 26 consecutive months of data files from Xinhua Spanish: xin_spa_200601 through xin_spa_200802 i.e. all files from 2006 and 2007, plus the first two files from 2008. The problem was that all letters with diacritic marks had been omitted in the text data for that portion of the collection. For example, the word año was presented as ao (minus the n-with-tilde character), aspiracion appeared as aspiracin, and similarly for all accented characters (UTF-8 letters outside the ASCII range). All copies of Spanish Gigaword Third Edition ordered after February 2013 will have this update included. More information is included in the readme associated with this update.